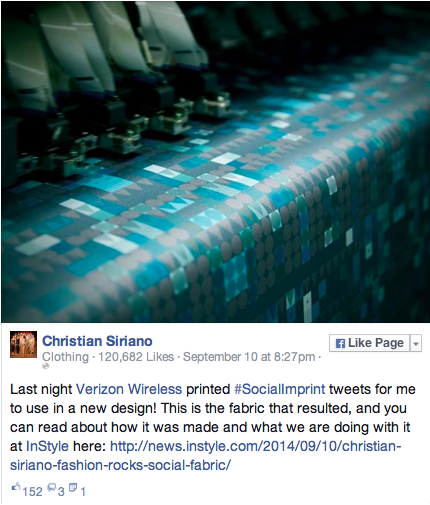 Over the last few years retailers have started to embrace phy-gital campaigns for the Holiday/Christmas season. Interactive windows and augmented or gaming-led apps drive footfall into physical stores at this crucial selling time, and integrated technology provides an engaging layer to the retail experience. Burberry kicked off the seasonal cheer in early November, with an interactive Christmas scene in the 11 windows at Paris department store, Printemps. Visitors can use the store’s wi-fi to interact with each of the weather-themed scenes, controlling a little boy’s Christmas journey from London to Paris with his teddy bear as he navigates thunder and lightening or a fleet of boats. The store’s traditional handmade puppets display at this time of year is as impressive as ever, and forms part of the interactivity. Passersby can also create virtual postcards of the stormy winter wonderland displayed in the windows, that are available to download and share across social media. 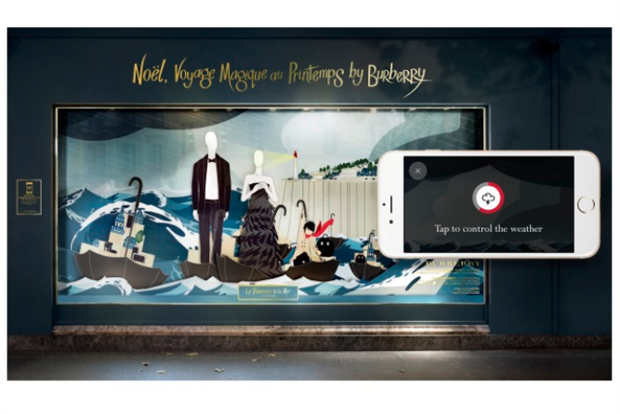 Bloomingdales and Barneys lead the charge of New York department stores for their respective mobile-driven and theatrical window campaigns this season. 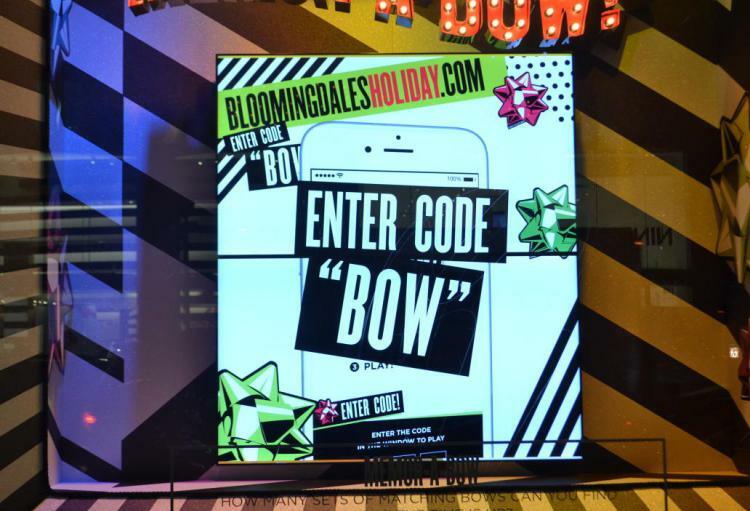 The Bloomingdales windows are gaming-led and feature a bow theme across a series of mobile-activated games and social media content activities. Passersby can interact with the Bloomingdales microsite Bloomingdalesholiday.com to start to play the three games: Memo-a-bow, Whack-a-bow and Peek-a-bow – a distraction while waiting for family members to shop inside perhaps? 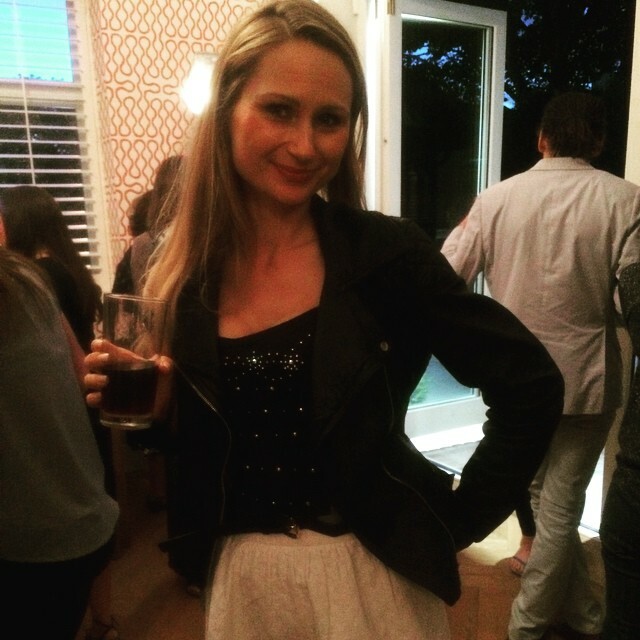 There is more bow-tastic interaction via the Photograph-a-bow experience, conceived by FaceCake, the virtual-mirror specialists, that allows window-gazers to take a selfie via an intereactive screen to share on their social media feeds. Using the hashtag #bloomiesgreetings, posts with bow-themed messages are automatically projected in another of the store’s window displays. Less digital but arguably more epic, is Baz Dazzled, the Barneys collaboration with film director/producer Baz Luhrmann and his set designer wife, Catherine Martin. Barneys always produces a theatrical display for the Holidays and Baz Dazzled is a multi-platform campaign – from the stage-like windows and live a cappella group performance by Pentatonix for launch night, to enchanting visual-merchandising scenes in every department – merging Luhrmann’s signature fantastical storytelling with Barney’s uptown cool. 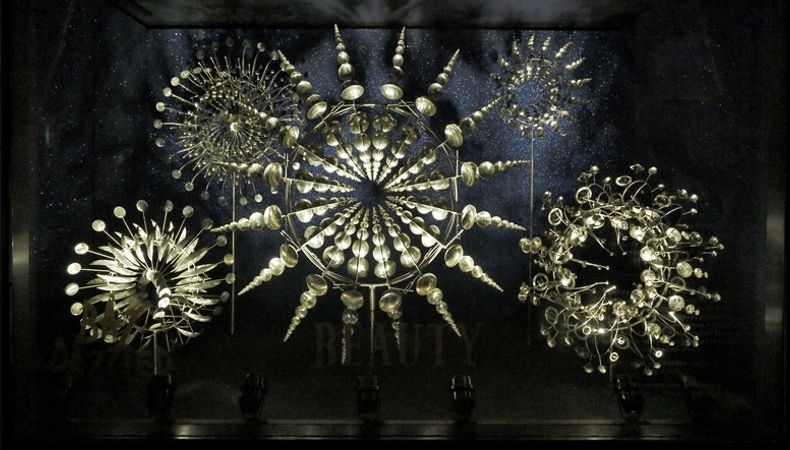 The interactive windows were just one component of a magical set design that allows the retailer to inspire and delight both passersby and captive audience. 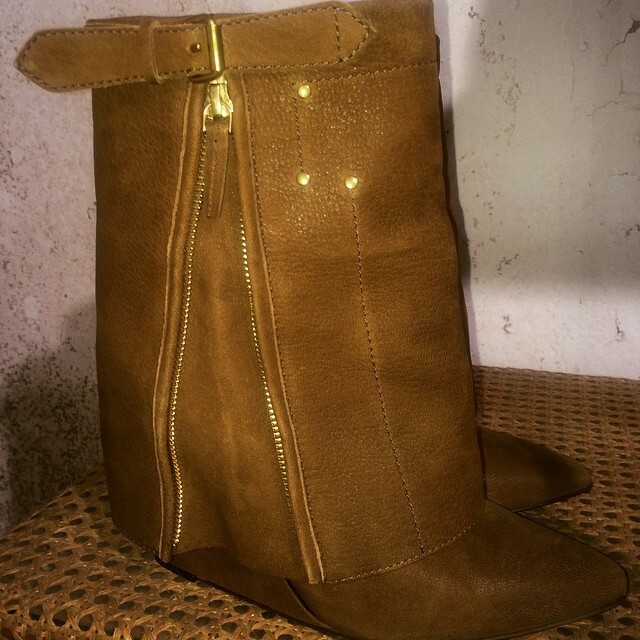 Keep an eye on Barneys The Window for updates. 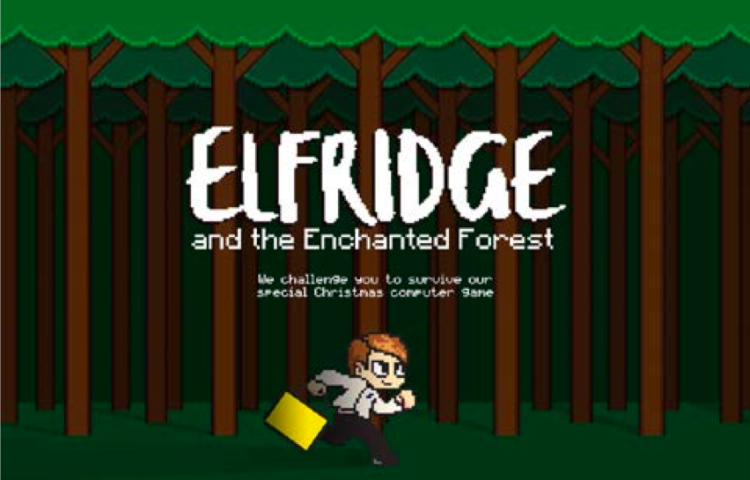 I like the subliminal phy-gital customer service message in Selfridges’ Christmas gaming app, ‘Elfridge and the Enchanted Forest’ , that lets gamers search for hidden presents stolen by a wicked Golden Goose, in order to ‘save’ Christmas. The five levels of play represent the department store’s five UK locations, and is a subtle reminder that in the real stores there are elves on hand to help with personalized gifting needs. The main criticism I have with the game is that there is no shoppable component to the app, so perhaps Selfridges might want combine the two in future? 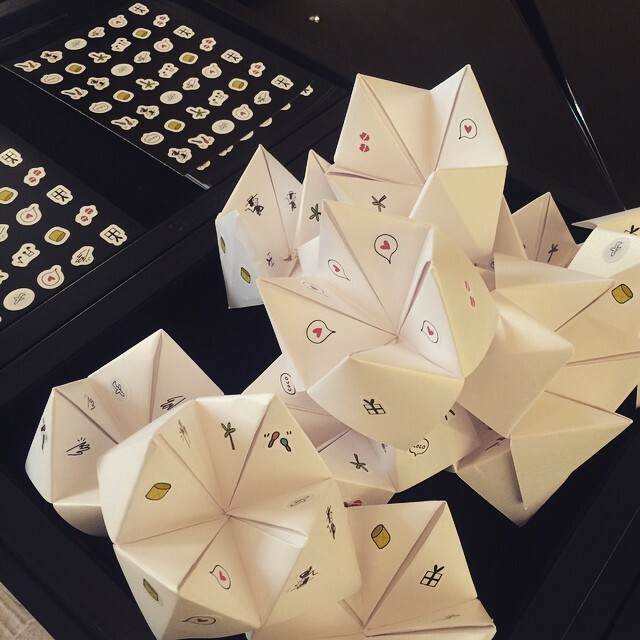 Target is much more on the gaming-leads-to-commerce agenda with its Bullseye Playground mobile experience in partnership with Google’s Art, Copy and Code development team. There are six games that allow users to hunt for codes hidden in store signage and then try their hand at sledge rides with the Target mascot dog, Bullseye or engage in a spot of ice-fishing. 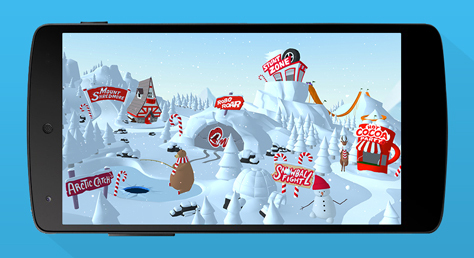 There is also a 3D experience available at some Target stores, via Google’s Project Tango tablets (as yet only available to developers interested in researching 3D motion sensing software), that create augmented winter wonderland settings in the aisles. This year’s John Lewis Christmas campaign featuring Monty the penguin and his young owner, Sam, has won hearts, viewers and social media sentiment all round. Monty even has his own interactive den in stores, created in collaboration with Samsung. In Monty’s Den, the worlds of education, entertainment, technology and shopping merge into one digital experience – where customers are lingering for longer. 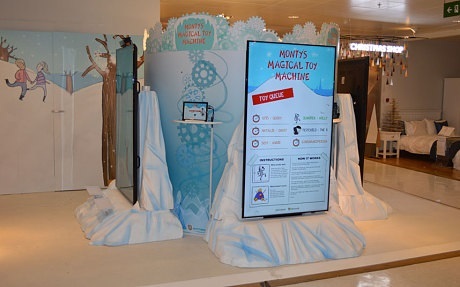 Kids and adults alike can have photos taken with Monty, learn about his Antartic ancestry, experiment with virtual reality eyewear for a 360 degree view of his home and create a virtual Christmas card using Samsung’s Galaxy Tab S. John Lewis also collaborated with Microsoft Advertising to create ‘Monty’s Magical Toy Machine’ kiosk that scans children’s toys to render them as 3D, effectively bringing them to life as a moving image through Kinect 2 Microsoft technology. 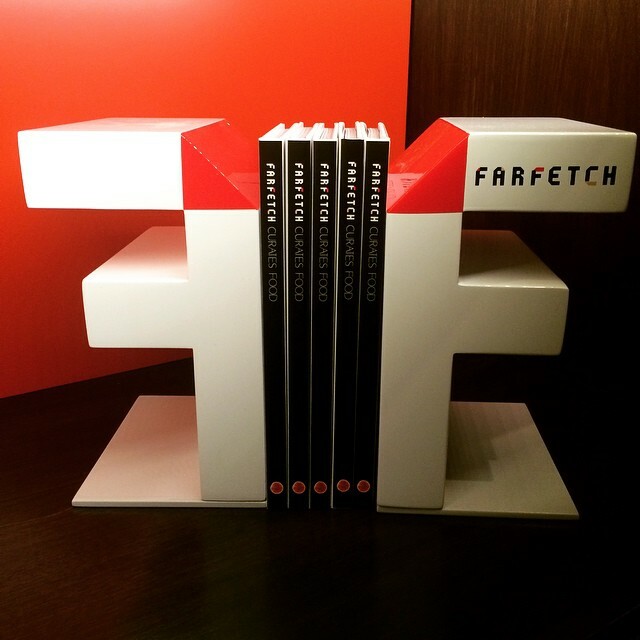 2014 is retail’s most interactive Christmas and Holiday season to date with integrated mobile campaigns fusing the physical store and digital experience for consumers who are shopping and looking for entertainment on their mobile devices wherever they are.